This article will inform you about the main Forex trading times and sessions. Forex trading times and sessions can be used as entry and exit signals. Integrating this information in your trading strategy has the potential to improve your probability of success. It can also prevent you from taking trades and getting trapped when the price is unlikely to go anywhere soon. Would you like to know when the best times are to look for trading opportunities? Then read this article to the end to learn all about it. The Forex trading times for the main trading sessions. What the main Forex trading sessions are. The best times of day to trade Forex. The best currencies to trade and the best times to trade them. Let’s get straight in to it. The Forex market is practically open 24 hours a day, Monday to Friday. I say practically because there are some minutes at the end and the beginning of each day when trading is temporarily suspended. This pause in trading is known as the market roll over. The Forex market opens on Monday at 08:00 in Wellington, New Zealand time. It closes for the day at 17:00 in New York, US time. The Forex market also closes for the week at the same time on Friday. The Forex market is closed on Saturdays and Sundays and opens again when New Zealand resumes business on the following Monday. As countries open and close for business, the major financial centers hand over the facilitation of trade to each other like a relay. This means that currencies can be traded around the clock. Forex trading times are usually marked by the opening and closing times of the major financial exchanges around the world. 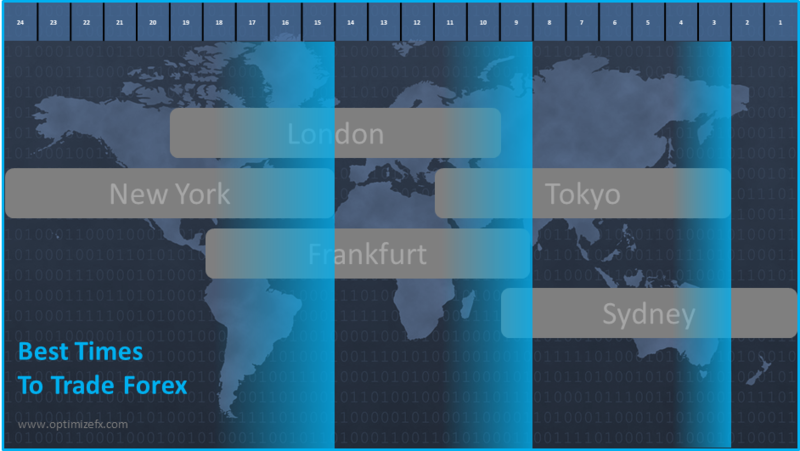 The most relevant countries where Forex trading times are recorded from are Australia, Japan, Germany, UK and the US. When you can actually trade though depends on the Forex broker you are trading with. The contract’s specification or your broker’s website will tell you the exact trading times for each symbol. For the MT4 or MT5 platforms, the contract specification can be viewed within the trading platform. To see it, right click the relevant symbol in the market watch window. Then select specification from the pop up menu that appears. As you can see, this Forex broker provides quotes from 00:00 (UTC +3) to 23:59 every trading day. Trading is also enabled from 00:01 to 23:59 every trading day except on Fridays when the market closes at 23:55. These two minute pauses in trading between week days is when the market rolls over. Any deals held will also get carried over to the next trading day. When this happens, you will also incur debits or receive credits for these deals from financing charges or the swap. A debit or a credit will depend on the currency pair and whether you are long or short. I will talk about this more in a later tutorial but the swap is another way you can potentially make money from trading Forex. The Forex trading day is split in to three main trading sessions. This breaks the trading day up and helps to make it more manageable. Their terms of reference also make it obvious as to which time we are referring to. Since Forex trading is a global business that covers every time zone. Each of these three Forex trading sessions overlaps with another session for some time before the daily close. Then the market rolls over from the US session, back to the Asian session and the cycle repeats. I will use the time in the market watch window on the MT4 and MT5 trading platform for the start and end times for each trading session. This time is the trading server time and is the standard time for the New York close price charts. The time zone is UTC +3 and it will be the same time for everyone trading on these platforms. You can find this time in the top left hand side of the trading platform. If you haven’t registered with a forex broker yet to download a trading platform, you should do this now. What is important when trading Forex is that you are aware of when these times are, wherever you are in the world. You should be able to easily convert these times in terms of your local time. The Asian Forex trading session categorically begins at the start of the business day in Wellington, New Zealand. This coincides with the pre-open trading time of the Australian Stock Exchange (ASX) in Sydney. It ends at the close of the business day in Tokyo, Japan time. This is when the Tokyo Stock Exchange (TSE) closes. The European Forex trading session begins at the start of the business day in Frankfurt, German time. This coincides with the opening time of the Deutsche Börse, which is the German Stock Exchange. It ends at the close of the business day in London, UK time. This is when the London Stock Exchange (LSE) closes. The US Forex trading session begins at the start of the business day in New York, US time. This coincides with the opening time of the New York Stock Exchange (NYSE). It also ends at the end of the business day when the NYSE closes. If you have an Android smart phone, you can download this FX hours app. It shows you when each Forex trading session opens and closes in terms of your local time. See the screen shot below. Here is something similar for iPhone users. Now I will explain why knowing all this can be used to your advantage. The best times of day to trade Forex are when markets open or early in the trading session. It is because more participants are coming online and the number of transactions tends to increase. This creates more supply and demand and pushes the price up or down. When trading sessions overlap, the market is more active, liquidity increases and the price becomes more volatile. This is want you want as a trader. You want to be capturing significant price trends to maximize your potential to profit. When the price trends and closes higher or lower for the day or week, it usually starts earlier in the trading session. You also want to be able to get in and out of the market easily. So the best times of day to trade Forex is when it is highly liquid. Having said that, the Forex market is the most liquid market in the world. You can buy or sell at any time. Spreads are usually tighter at these times too, which reduces your trading costs. This is another reason why these times are the best times of day to trade Forex. Since there are three main trading sessions, there are three times each day that are the best times to trade Forex. Each trading session is not necessarily and equally the best time to trade though. It really depends on what is happening in the market. Also, this does not mean you should trade every day or at each of these times. However, you will observe that these times often do provide the best times to trade. When you optimize your market timing and the entry and exit price, you can limit risk and maximize your potential to profit. It takes practice and experience but you can check your price charts and observe this in action. 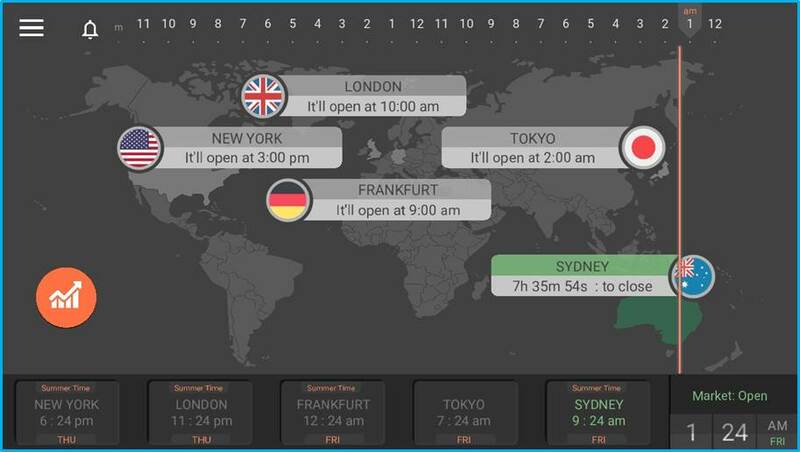 The image below shows the best times of day to trade Forex during daylight saving time. This is the trade server time for the MT4 and MT5 platforms, which is UTC +3. You can convert these times to your local time or follow the time in the market watch window. Trading volumes and liquidity differs during each Forex trading session. Which means volatility will likely be higher or lower at certain times of the day and during each trading session. Volumes, liquidity and volatility are also different between currency pairs. Some currency pairs are naturally more volatile than others. The most liquid and most volatile times to trade under normal market conditions is when the EU and US sessions overlap. Spreads are tighter during these times and the price tends to trend better too. In my opinion, the best opportunities can be found at the beginning of the US session. The second best times of day to trade are at the beginning of the EU session and the London open. The least liquid time is during the Asian session. The Asian session is also categorized by lower volatility and wider spreads. This is particularly the case shortly after the market rolls over. If you open a trade around this time, your transaction cost will likely be higher. In my opinion, the Asian session is the third best time of day to trade Forex. The market tends to consolidate and become range bound during this time. Now that you know when to look for the best trading opportunities, also consider what currencies to trade. The best currencies to trade and at what time to trade them, is related to the trading session. Ideally, you would want to be following currencies that are active for the session. For example, during the Asian session, consider looking for trading opportunities in the AUD, NZD and JPY. During the European session, the EUR, GBP, CHF and ZAR are more active. When the US session starts, the CAD, USD, MXN and BRL are good to trade. This is to name just a few but I think you get the idea. This doesn’t mean that the AUDJPY won’t be active during the EU and US sessions. These are the most active trading sessions so it will be. You just might be able to get an optimal trade entry for this currency pair during the Asian session. Having said that, the EURCHF won’t be as active or as volatile during the Asian session as it will be during the European session. Since the banks are closed in Europe at this time and the market is “sleeping”. Generally speaking, it will be to your advantage to trade currency pairs for those countries that are online at the time. I would suggest observing what the price does and has done during these times on your chart. You can decide what currency pairs to trade depending on your findings and what suits you. Trading is not an exact science, there are no certainties and markets do change over time. It is about determining patterns and trends, assessing probabilities and balancing risk vs potential reward. Timing is just one variable in Forex trading that could help stack the probabilities in your favor. It is a good idea to pay attention to it. I appreciate that you probably have a job and this might make it difficult to trade during the day. Naturally, you will be considering what the best currency pairs to trade at night are. If you are in an Asian time zone, you are somewhat in luck. This is because you could catch most of the European session and the open of the US session at night. Any currency that is paired with the USD or CAD would probably be the best currency pairs to trade at night. For traders in a European time zone, night time trading would allow you to catch the second part of the US session and the Asian session open. The AUDUSD and the USDJPY could be good currency pairs to trade. Any currency paired with the USD, CAD, NZD, JPY and AUD might provide some trading opportunity. Night time trading in a US time zone would involve trading during the Asian session. If you are inclined to trade in the early hours of the morning, you could also catch the European and London open. The Best currencies to trade at this time would be those that are paired with the AUD, NZD and the JPY. Then for the European and London open, currencies paired with the EUR, GBP and the CHF as an example. However, it is worth mentioning that just because you have opened your trading platform, this does not mean that you must find a trade. Being proactive in the market rarely works out for the best. Instead, you should be reactive. React to events and the signals the market gives you. Sometimes the best position is not to have a position and simply do nothing. You should only trade when you think the risk is relatively low and the probabilities of success are in your favor. When doing your analysis of the markets, you have choices in how to trade as well as the execution. Such as trading over longer time frames and using pending orders. Alternatively, you can execute at the most optimal times from your smartphone. Trading doesn't take much time when you know what you are looking for. There are as many ways to trade as there are traders. This is all just a suggestion and should be used together with other indicators and signals. You should observe the charts and check these Forex trading times and sessions with your preferred currency pairs. Only then will you find out what works best for you.